July 7, 2017 | -by: Kevin George. While creating out-of-the-box email templates is one of the most essential factors that affects the success of an email campaign, there is one more thing which is as important- getting the template ready on time so that you don’t miss out on an opportunity. The Monks design and code immaculate emails that are Litmus tested across 40+ email clients and do all this in 8hrs TAT so that our clients get the best out of each email campaign. Continuing with our Customer Speak blog series, we have one of our regular clients speak about their journey with EmailMonks. Monks: Can you provide us a quick overview about your Company? Andrea: Signpost is an AI-driven CRM that collects consumer data and sentiment to drive new and repeat customers for local businesses. As one of Forbes Most Promising Companies, Signpost has been able to generate, on average, a 10% increase in revenue across their portfolio of customers. Monks: What is your role in the organization and team? Andrea: As the CMO I oversee the Marketing and Customer Success organizations. I am responsible for demand generation, brand messaging, creative, marketing automation, marketing communications, PR, and marketing/sales alignment and our customer retention rates. Monks: How long have you been in the Email Marketing industry? Andrea: 15 year now! I’ve been into developing strategic and tactical B2B and B2C marketing campaigns, executing experiential marketing events and programs, and maintaining vendor and partner relationships. I also have an extensive experience in developing marketing communication plans, developing and promoting product marketing communications, procuring and managing best in class marketing technologies, and social media management and mobile engagement. Monks: What have been your major challenges pertaining to email templates during a campaign? Andrea: The time it took to develop an HTML email within Marketo was challenging. Marketo requires a responsive email, but we also wanted to ensure that it rendered appropriately across every device. We faced some issues with Marketo integrated emails and were looking for speedier deployments. Monks: What kind of solutions were you looking for to beat the challenges? Andrea: We were looking for an easy to submit, but high-quality project team that was responsive to our needs. Monks: How did you come to know about EmailMonks & why did you choose Monks for email template production? Andrea: A quick search produced Monks, but their testimonials were top notch. I could not have been happier with their quality of work. Monks: How EmailMonks could help you beat your challenges? What difference has it made to your campaign performance? Andrea: They are an extension of the team, reliable, quality, flexible and true partner at an excellent cost. They are well-acquainted with Marketo’s coding standards and API and they make it really easy for clients to accommodate templates in Marketo. Another thing that is worth a mention is that they deliver the Marketo templates in an amazingly quick TAT. Monks: Tell us about a specific project where EmailMonks could help you find a remarkable solution – Challenges, Quality, TAT, Cost, etc. Andrea: We email topical content on a regular and frequent cadence. It is thus essential that we get our templates designed and coded well in time. Furthermore, as the emailing is frequent we need novel, beautiful designs each time and the Monks really do a good job, I must say. In fact, they are now an extension of our team. Monks: How has been your experience working with EmailMonks? 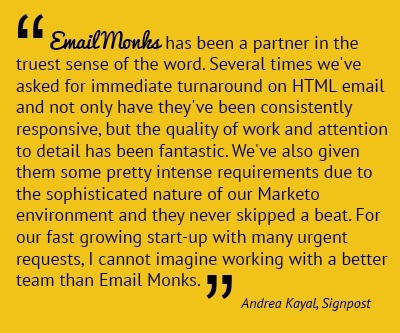 Andrea: There’s only one word that can explain our experience with EmailMonks- EXCELLENT. We’ve been associated with their team for almost 2 years now. Apart from email templates, they’ve also worked on our Landing pages. If I need to point out two factors that set them a class apart, they would be- fast TAT and outstanding coding standards. Monks: What would be your recommendation for people looking out for similar solution? Andrea: If quality along with quick TAT is what you are looking for, there’s no one like EmailMonks. Give them a task and they will provide you with an excellent template, designed and coded just as you wanted them to and in the time frame promised (sometimes even earlier). The Monks are always happy to support everyone who needs help with email templates and landing pages. And as for Signpost, we are more than happy to have you as our clients.